I am completely astounded by how SwissRidge Kennels has grown since its humble beginnings with just one dog in the heated barn behind my mom’s house in Beaverton, Ontario. At 15, when I produced my first litter, I started dreaming big—but not so big that I ever expected to see my pups leashed to celebrities in Hollywood magazines! ​That’s happening now, but of course, the glamour goes to the dogs. I’m still cleaning out dog pens, delivering litters of pups, doing vet runs, or driving my truck around filled with supplies. 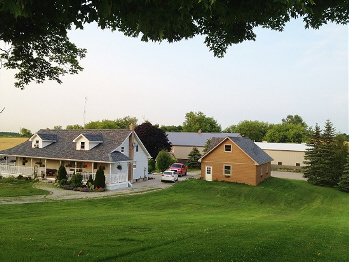 ​Although I’ve been breeding dogs far longer, I formally established SwissRidge Kennels on a 20-acre property in Lindsay, Ontario in 2004, when I graduated from college. I built my reputation through careful and conscientious breeding—health-testing each and every dog, and sharing the records publicly. I provide lifetime support to my clients, and my contract stipulates that any dog I breed is returned to me if for any reason an owner cannot keep it. ​I introduced my “matchmaking” program, in which I choose the right puppy for a client. This involves close observation of the puppy, temperament testing at 7 weeks using the Volhard puppy aptitude test, and careful scrutiny of detailed applications from clients. Although I breed for a calm temperament, subtle variations can make all the difference in a fit with a client’s needs. Since introducing this process, client satisfaction has soared. 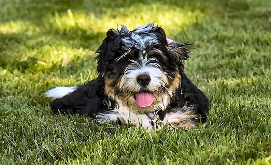 ​SwissRidge has become the kennel of choice for Goldendoodles and Bernedoodles. My client list now includes famous artists, athletes and movie stars. I published a book, Bernedoodles: A Head to Tail Guide in August 2013, which has well over 50 positive reviews. The SwissRidge Facebook group currently has about 2,500 highly engaged members who kindly promote my dogs through word of mouth, and also help each other in ways I never imagined. This forum has become incredibly rewarding! I have made accessibility and communication major priorities, even as the kennel grows. While I now employ staff to help care for my dogs and support my business, I am hands-on in every respect—even if that means the late night cleaning shift, and especially if it means a puppy delivery! My special relationship with my clients means they can tell me what they want and need, and I try to adapt and accommodate where I can. When someone proposed crossing the Bernese and the Poodle, I gave it a try—with fantastic results! When people started asking for older puppies with some training, we launched the imprinting program. Listening to my clients has always served me well. As a result, I will expand our training, boarding and other specialized services in the near future. I’ve found the perfect location to stage this expansion, and expect to break ground on a kennel in 2014. One building will house my breeding dogs in a state-of-the-art facility. The other will provide training space, and as well as upscale boarding suites. Meanwhile, I am slowly but surely developing a new hybrid line. I have a vision that will take years to achieve because it must be done with great deliberation. One day, I expect to have a premium SwissRidge hybrid that has all the traits my clients love in a gorgeous, healthy, allergy-friendly package. Our new 52-acre property in Schomberg, Ontario will be home to a state-of-the-art breeding facility. There are 2 ponds where the dogs can swim, and 4 walking trails in a beautiful, secluded forest. Schomberg is an easy commute from the Greater Toronto Area.